A year of restoring the sacred, made possible by you. This is StoryTel Foundations annual report about the work we did this year telling God's stories. It's our mission to inspire people with stories about ordinary people who answer God's call to do extraordinary things in their lives and within their communities. We're using media, in all its forms, to cultivate reverence towards God and the things of God by telling stories that encourage people to grow closer to God in their daily life. We hope to save souls for Heaven and make the world a better place, one viewer at a time. 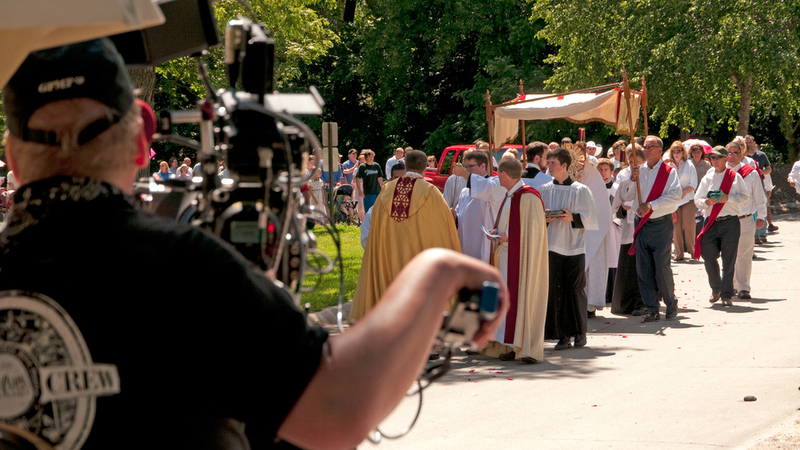 A series of three videos completed for the Archdiocese of Omaha's Totus Tuus program. The Program. Totus Tuus (Totally Yours) is an energetic, national, parish-based summer catechetical program, for grade school through senior high school youth. Our Work. We utilized green-screen, compositing, and other computer generated imagery to create the look for this program. It has a natural look, but every element aside from the people interviewed was created in the computer. We brought the story to life by animating photographs from past summers and combining a number of sound effects and music. "You guys rock! God bless you and your work!." --Beverly I. In April our third On Assignment documentary film, Where Heaven Meets Earth, Restoring the Sacred at St. Peter Church, premiered on EWTN. The Program. Built in 1886, St. Peter's Church was one of the biggest parishes in Omaha, Nebraska. The construction of interstate 480 forced hundreds of parishioners to move away, contributing to its steady decline. In 2004 the parish's young pastor was inspired with an idea that would prove God had other plans for St. Peter's. Our Work. The filming included two days of large-scale shoots, with seven cameras filming simultaneously capture the beautiful footage. This project also marks our first venture in to aerial footage. The program is a huge hit and has aired multiple times this year on EWTN. StoryTel and St. Peter's were blessed to receive widespread press coverage and promotion for Where Heaven Meets Earth. We look forward to taking what we learned from this film promotion effort and applying it to our next film premiere. The Project. As usual, we created a DVD for distribution following our first broadcast of Where Heaven Meets Earth. Our Work. We went all out on the creation of the Interactive DVD. We created a new brand called "StoryTel DVD." It includes Hollywood-style menus, bonus features, subtitles, the works. We also created a beautiful package and label, which is often the first impression of the film. We're very proud of how it turned out. The Results. The response from the EWTN broadcast and the surrounding press coverage was huge. We have distributed about 1000 copies and counting. When we receive a request for a DVD, we will often send two and ask them to prayerfully give a copy away, to reach an audience who has not yet had a chance to watch the film. We have received many notes of thanks and many testimonials about how the film affected you. Some of you have already shared the film with your parish and pastor and began the discussion of restoring certain aspects of the sacred in their own church communities. Our original and still most popular On Assignment documentary film has been restored, remastered, and re-released on DVD. The Project. We originally told the story of Saint John Cantius parish in 2008. With the advances in HD and other film technology, in 2013 it was time to restore the documentary. Our Work. We re-framed each shot to fit the wide-screen shape. We color-corrected. We re-created all still photos and titles in high definition. We remixed the audio and updated several music tracks. We produced a separate spanish language track and added english subtitles. We created new menus and packaging under our new StoryTel DVD brand. We created a new trailer to promote the restored film. "Your work is indeed very beautiful... Deo gratias for storytel…yay! May God send you many people who will support your work financially and most especially spiritually through prayers and sacrifice. Thank you. God love you!" September 30, 2013 marked the 14th broadcast in 4 years of our most popular documentary Saint John Cantius, Restoring the Sacred. Together the Spanish and English Saint John Cantius productions are reaching over 230 million homes throughout the world on eight different EWTN satellites. Our latest film, Where Heaven Meets Earth was broadcast 4 times this year across the various satellites. “You are truly a Blessing and an Inspiration to do all this work for the Lord. I’m enclosing my donation to help in your work -- God bless you! --Mary Sue B. After a tremendous amount of work we launched our new website. The project. We needed a website that did several things much better. First, we needed a better way for people to order DVDs. The process by making a donation through PayPal was confusing. We also had to make it clear that StoryTel operates on donations, and make it easy to donate. Finally, we needed a great way to better show off our films and many active projects. Online Store. Our hosting provider offers great e-commerce tools, but the only way to take advantage of it was to recreate the site from the ground up. That gave us the opportunity to make a very cool website, using tools and skills we've been acquiring over the past few years. Our DVDs are now easy to obtain, but we also allow our visitors a way to donate any amount they wish, or even order a free copy. Donations. The new site clearly shows that we continue our work only through the generosity of donors. And now it is easy to make donations right on the site, avoiding a side trip to PayPal. We've also introduced the concept of supporting a particular film project. Showing off our work. We took inspiration from some of our favorite media sites, such as Pixar and PBS. We found ways to show off our films in a pleasing way, making it easy to navigate through our entire body of work. We also think it just looks cool and is a great web experience. We are very proud of it. “Thanks for all this great work you do for the Church. We need artistic eyes like yours.” -- Omar G.
In November we completed editing our Miles Christi film, and after test screening it with a small group of people, we sent the final version to EWTN to begin the review process, which ends with the film's broadcast. Our work. We spent most of the year editing our largest, longest, and most complex film yet. This was our first project involving international filming, and also includes our first full length original music score. It's quite beautiful. Coming soon. We expect to announce the film's premiere broadcast date, as well as upcoming screenings very soon. Complete our fifth On Assignment documentary film about the spiritual life of Father Edward J. Flanagan. Continue producing short videos for new clients and other worthy causes. StoryTel Foundation is a non-profit film production company that tells and distributes the stories of worthy organizations regardless of their ability to pay the full cost of high quality production. Most of the production cost is subsidized by the donations of people that share our vision of spreading God’s stories using all available media. Please make a donation today, or support one of our in-progress projects. If you cannot make a financial donation at this time, please keep us in your prayers and let us know that you agree with and support our mission. From all of us at StoryTel, thank you for your prayers and support. We wish you a very merry Christmas and a blessed New Year!